We’re a Housing Association, working out of Hampshire and parts of Surrey. 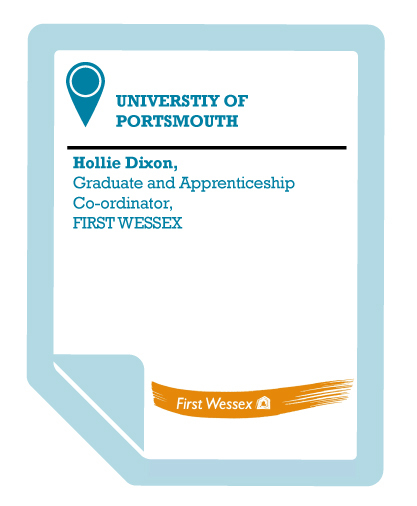 I look after the graduate and work experience programmes. We work through University of Portsmouth’s dedicated employability arm – Purple Door – to promote our opportunities. I’ve done events and I go to recruitment and volunteering fairs to promote the company. We started our graduate scheme last year and have so far recruited four graduates across IT and surveying. We’re due to recruit up to three more in the near future. Graduates are valuable for our business because they bring relevant and recent academic knowledge into the workplace, we get people at a good point in the career – early on when they’re enthusiastic, ambitious and keen to get to work after studying for three to four years so their attitude towards the workplace tends to be very positive. Because our head office is in the Portsmouth area it’s important for us to work with the local university. The University of Portsmouth provides a good service through Purple Door where they have a dedicated team to help with recruitment and work experience. They have a bespoke recruitment team that helps to match students and graduates to roles and their staff are professionals who can recommend our roles to graduates. The University is very commercially aware so they are able to understand our needs as an employer and they’ve always been very helpful. I like to attend events to increase our brand and meet different students throughout their degrees. Engaging with the University of Portsmouth and Purple Door has exceeded my expectations. The graduates we have recruited are getting on really well, we’re very pleased. It’s been a very positive experience. I would definitely recommend engaging with the University of Portsmouth. I think the key thing for employers is Purple Door. It is the point of contact that you need when first engaging with a university. It offers an all round service for employers – an opportunity to offer roles and specialist work experience, to promote opportunities to the students and to put you in direct contact with the relevant academics. It really gives you the opportunity to increase your employer brand as well. It’s particularly useful in terms of making that first connection and then being able to access the people you want to access with minimal effort.